In reading about various bits of music history in order to write the previous post, I stumbled onto something that I couldn’t fit but felt I should make note of anyway. The hexachord is was invented by the 11th-century music theorist Guido of Arezzo, who is honored in the alternate name for the concept, the Guidonian hexachord. Second, good ol’ Guido is also credited as having invented another concept known variously as the solfège, the solfeggio, or the solfa. It’s more commonly known by its components: do-re-mi-fa-so-la-ti. All three terms for this are derived from two of the syllables, so — which previously was sol — and fa. There’s also a term solmization, which refers to the practice of giving each note in a musical scale a corresponding syllable and which itself comes from to syllables in the solfège, so and mi. The Wikipedia page on solmization notes that various cultures have their own string of nonsense syllables. Various Vedic texts refer to the seven notes sa-re-ga-ma-pa-dha-ni, while Byzantine music based its syllables off the first seven letters of the Greek alphabet to form pa- vu-ga-di-ke-zo-ni. Japan has i-chi-yo-ra-ya-a-we, which comes from the poem Iroha, which also notably uses each character in the hiragana syllabary exactly once. So now the question you should rightly be asking is this: Can Drew relate this to video games? As clever video game players discovered — and dumb ones found out by calling the Nintendo help line — the parrot is giving the order that the keys of an organ must be played in order to extinguish some flames blocking access to the next area of the game. 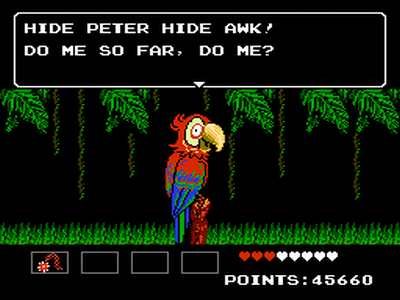 While the legacy of Guido of Arezzo lives on, it bears mentioning that Nintendo never made another StarTropics game beyond the lifespan of the NES, likely as a result of that inappropriately sexual parrot. Very cool! The second syllable of the English word "gamut" originated from this syllable's musical role. The word combines the Greek letter gamma and the solfege syllable "ut." ORIGIN late Middle English : from medieval Latin gamma ut, originally the name of the lowest note in the medieval scale (bass G an octave and a half below middle C), then applied to the whole range of notes used in medieval music. The Greek letter Γ (gamma) was used for bass G, with ut indicating that it was the first note in the lowest of the hexachords or six-note scales (see solmization ).